USAID-supported program helps HIV/AIDS orphans and their new families thrive. Mama Wanja’s small family slept in shifts—the floor of her mud hut could barely fit the two burlap sacks serving as a makeshift bed. She and her two grandchildren crowded together to sleep at night, while the grandfather slept during the day. The arrangement was a reflection of the family’s impoverished condition. In their seventies, Mama Wanja and her husband began raising their second family, the son and daughter of their daughter Nancy who died of AIDS in 1999. The elderly couple really couldn’t afford to take in the grandchildren, but when their daughter died, the brother and sister had nowhere else to go. Life on this steep hill outside Embu has always been a struggle. Since her husband went blind 20 years ago, Mama Wanju has had to work the land alone. And with two new mouths to feed, she simply couldn’t produce enough food to satisfy her grandchildren’s hunger. But when the Anglican Church of Embu got support from the U.S. Agency for International Development’s (USAID’s) AIDS, Population and Health Integrated Assistance II Program (A2E), in Eastern Province, to expand their work helping children orphaned by the AIDS epidemic, church volunteer James Karimi reached out to Mama Wanja. “I have seen this program change lives in this community,” he says. The benefits of the program are evident on that scrappy hillside where the diminutive Mama Wanja lives. Welcoming a few recent visitors, she gets up to proudly show them her new house. The Anglican Church and A2E gave her the metal roof, nails and timber. The community provided the rest, including labor to build the house. Inside, there are two rooms for sleeping, with cots and mattresses. Sacks of surplus dried maize sit in a corner. Mama Wanja explains that the program taught her to hold onto it until the dry season, when she can sell it for a better price. The project, she explains, smiling, has changed everything. The Anglican Church of Kenya-Embu Diocese is one of 13 local organizations working with OVC and currently supported by A2E, which is managed by Jhpiego in coordination with six partners. The local organizations are selected by A2E, together with the Children’s Department of the Kenyan government and community leaders in each district. The A2E project provides the local organizations with funds and training, enabling them to expand and reach more children with a more complete package of services. The goal is to empower OVC and their caregivers to live healthier, happier lives. Over a period of four years, the organizations have expanded from supporting 1,500 to 60,000 children. 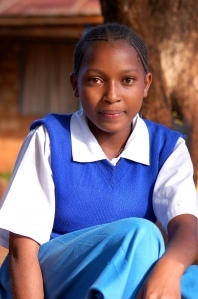 The OVC program provides financial assistance so children can attend school. 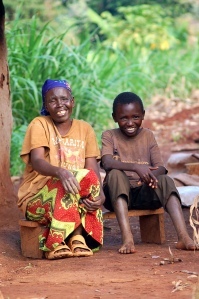 OVC programs ensure that orphans and their caregivers have access to nutrition information and food, shelter and care, legal recognition and protection, education and psychosocial support, and health care and HIV-prevention services. The A2E project trains master trainers in each organization in these principles. Because some caregivers are initially afraid of their charges, stigma issues are addressed directly during training. Each caregiver, in turn, is then trained on these issues. Once a caregiver has been through the training, the family becomes eligible for individualized micro-support for school fees, uniforms and basic building materials to renovate inadequate shelters. Some families receive goats and beans to improve their nutritional status and generate additional income for the family. When these animals have babies, the first two are given back to the program, then given to support other families. These innovative “pay-back” methods create self-sustaining systems with exponential returns.